IOWA CITY, Iowa (AP) — Iowa coach Kirk Ferentz caused a stir last week when he intimated that star tight end Noah Fant’s lack of snaps in a loss to Northwestern was due in part because T.J. Hockenson had passed Fant on the depth chart. The Hawkeyes (7-4, 4-4 Big Ten) corrected course last week at Illinois: Fant was predictably fantastic, scoring the game’s first touchdown in a 63-0 rout. It has nonetheless become clear that Hockenson, a redshirt sophomore, just might be the best player on Iowa’s roster. He has caught 41 passes for 663 yards and six TDs, and on Monday was named one of three finalists for the Mackey Award, given to the nation’s top tight end. Hockenson put up enormous numbers at tiny Chariton (Iowa) High, with 85 grabs for 1,219 yards and 17 touchdowns as a senior. But when he and Fant came to Iowa in the same recruiting class, Fant that was expected to be the star and Hockenson was seen as a potential complementary piece. Hockenson redshirted in 2016 while Fant played right away. 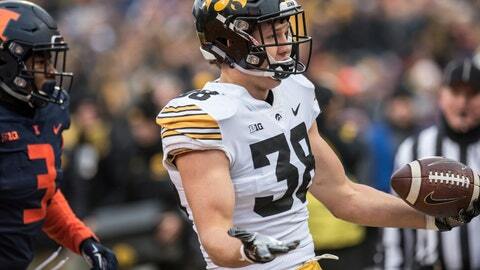 But as Hockenson sat two years ago, former Iowa star and current San Francisco 49ers tight end George Kittle took him under his wing. And once Hockenson got a chance to play, it was evident that the Hawkeyes had found something special. Hockenson started along with Fant from the opener in 2017 and had 24 receptions for 320 yards and three TDs. With teams often focused on Fant this fall, Hockenson has blossomed into Iowa’s top option. And Fant — who has 38 catches for 507 yards and seven TDs — has at times benefited from the attention paid to Hockenson. Hockenson, who is averaging 16.1 yards a catch despite playing inside, says he and Kittle still talk regularly. The relationship has paid off for Hockenson, who at 6-foot-4 and 250 pounds has a nearly identical frame as Kittle. Iowa closes the regular season on Friday when it hosts Nebraska (4-7, 3-5). There is a chance that Fant, whose 19 career TDs rank third all-time among Big Ten tight ends, might join Kittle in the NFL as soon as next season. And maybe Hockenson, too. Hockenson said that leaving early for the NFL is “definitely an option,” adding that he won’t have an answer until he gets a chance to talk with Ferentz and offensive coordinator Brian Ferentz after the season. “During the season you take it day by day. But at end of the season you’re looking back to see what you did and what you can do in the future,” Hockenson said.